News Tidbits 10/25/12: Harold Square Is Big, Boxy and…Big. Well, if I have any right to brag…I’m just going to leave this here. At least I have proven that I’m fairly good at what I write about. Now, onto what’s actually important. This project is massive. 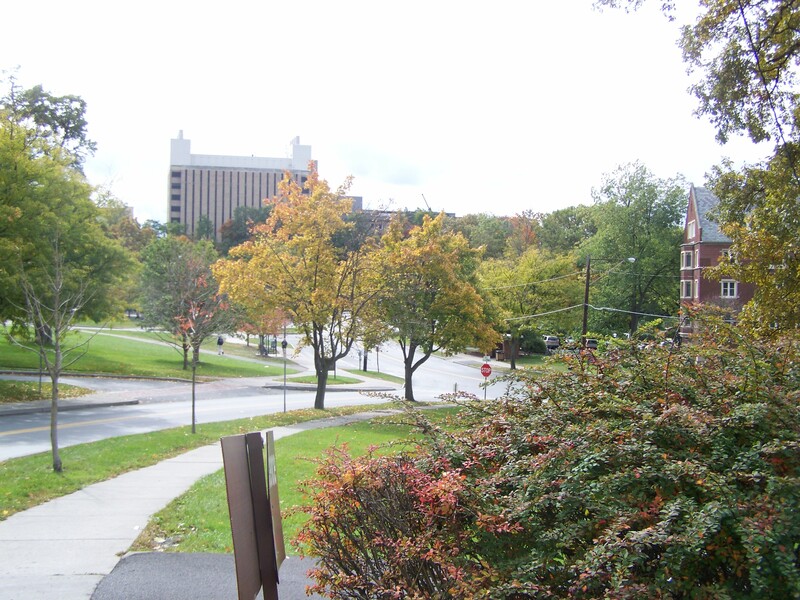 There are few private non-institutional buildings to compare it to in Ithaca. Seneca Place is about as close as one gets dimensionally, but that building is retail, with office and hotel on the upper levels. Harold Square, with its $30 million price tag, will have 60 to 70 apartments, 126,000 sq ft of office space, and retail on the ground floor. At 11 floors and~135 feet, it is a rough tie with the other tallest non-campus building in the county, Titus Tower. As previously mentioned, a building that size would need a zoning variance. 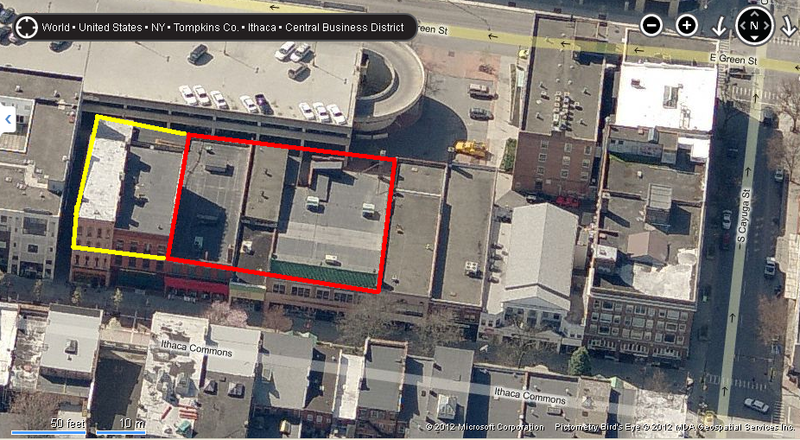 The building would be situated on the Commons, and remove three under-utilized structures (red box): the former Race Office Supply Building, the Night and Day Building, and the former Harold’s Army-Navy Store between them. The developers’ father ran the Army-Navy store for over 30 years and renamed it after himself; and this is from which the project gets its name. The Home Dairy and Benchwarmers (technically, the Sage Block and W.H. Miller Buildings; yellow box below) would be preserved and renovated. The Commons Side of the building will be four stories of office, more conservatively designed to fit in with the other Commons structures. It’s fairly standard glassy box with a brick veneer, adding some interest by making the middle third 3 floors and the sides four floors. [Update 11/09] The low-res image below comes out of The Ithacan. It’s…well, to me anyway…it’s not pretty. It’s big, certainly. But it’s a bit…out of place in Ithaca’s downtown, in my opinion. The design is by Chantreuil, Clark & Jensen of Rochester, who mostly do renovations, but do seem to get their blood flowing with the occasional modern new-build (most of their clients appear to be higher ed; no surprise here). 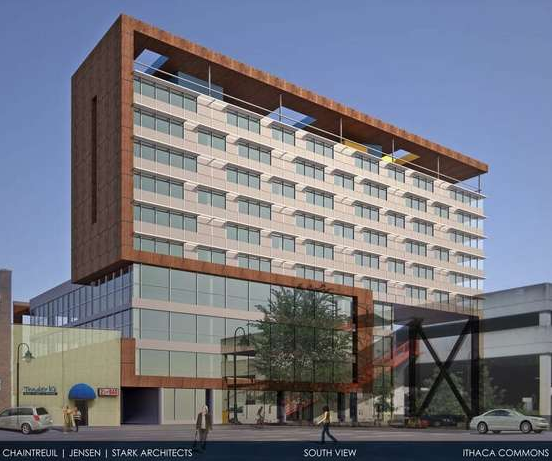 It’s a little more avant-garde than the other modern boxes planned, like the Marriott, Holiday Inn and Cayuga Green. And I don’t know how well a box with a gigantic metal overhang above its top floor will age, let alone a giant exposed metal truss on the southeast corner. The Commons side is appropriate enough, but I don’t find the south side, with the tower, especially eye-pleasing. Probably because it has misaligned windows, it’s already on my crap list. But, as anyone who’s followed this blog is aware, I’ve never been a huge of modern architecture. So, to each their own. So, with regards to a time frame, the developer is looking to have the Commons side completed by summer 2014, and the tower at some date thereafter. The developer plans the construction of the building to coincide with the reconstruction of the Commons. That’s assuming it jumps through all the variances it needs, and the Planning Board appreciates modern architecture. If Collegetown Terrace was any indicator, this will not be the final design, so it’ll be worth seeing how this evolves before final site approval is granted. A New Proposal For Ithaca’s Downtown? Okay, technically two items, because Wal-Mart Plaza (South Meadow Sqaure) wants to add more retail space. But this Harold Square project is far, far more intriguing. A thorough search for any online documents for this project reveals as much as closing your eyes. 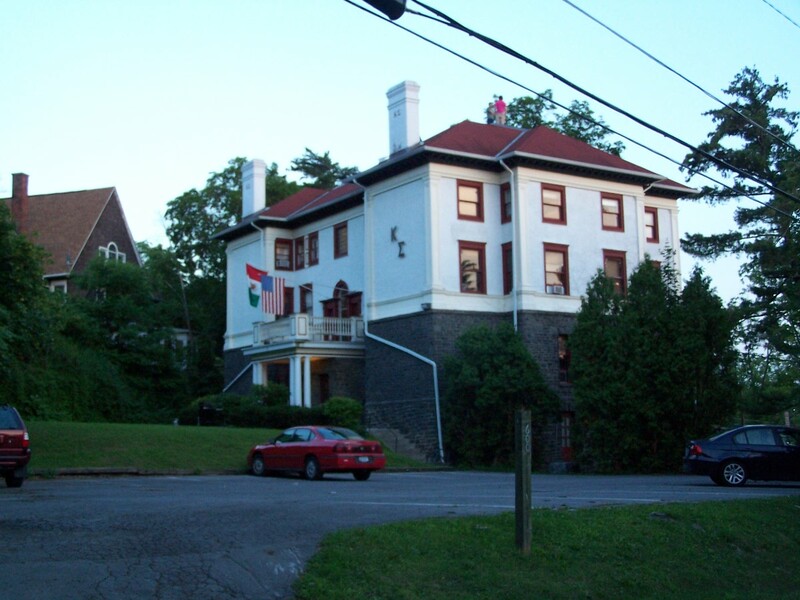 However, David Lubin does have an appropriate background – he sits on the Downtown Ithaca Alliance and is employed as the President and CEO of L Enterprises, a real estate development firm based out of Elmira. Google Maps indicates it’s an LLC (Limited-Liability Company, a common feature of development firms) based out of a suburban office building next to the Arnot Mall, and likely developed several green-friendly chain hotels in the Elmira area. So, one could sum this up as the head of a medium-sized, regional developer. “Downtown mixed-use” is a pretty tempting phrase. 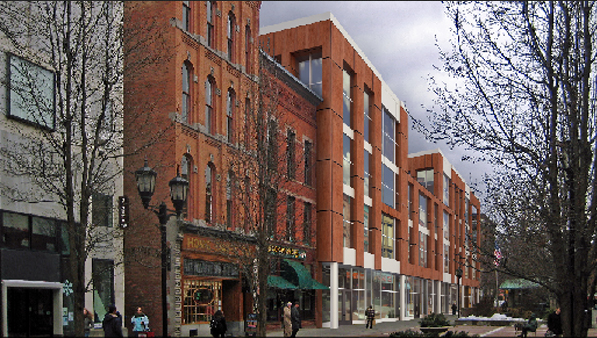 Mixed-use would likely be commercial, with residential on upper floors. The commercial may be hotel, as the developer has previously had experience with, or office, with service/retail on the ground floor. 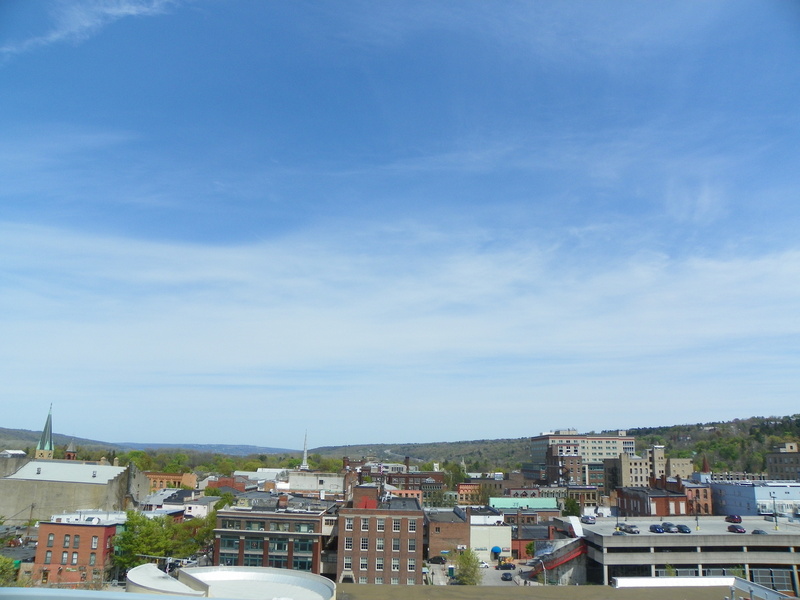 Depending on location and size of parcel, the building could legitimately reach 120 feet / 10-12 floors, but given that most of downtown Ithaca’s zoning is a little shorter, 60-100 feet, 5-8 floors (taller floor plates for commercial applications) would be more likely. This is potentially big project for the city, and certainly one to keep an eye on as it goes before the planning board next week.